ON January 13, 1849, the battle of Chillianwala was fought and this January was its sesquicentennial anniversary. Many of us have forgotten this great action which shook the edifice of the British Empire in India. Its traumatic effect on the British nation was similar to that of Balaclava and Gallipoli. There was an "outcry in England when news arrived that at Chillianwala a British army had been fought to a draw by wild Indian people". The wild Indian people, of course, were formations of the Sikh army which challenged what was till then considered the invincible British army, inflicting stunning casualties on a much better equipped adversary. Had Chillianwala been followed up to its logical conclusion, the power configurations in India would have dramatically changed. These, however, are the inevitable ifs and buts of history. In addition to the material available on this battle in India, there is a very well researched volume titled Chillianwala by a Pakistani, Major Moin, with useful comments by a Brigadier and a foreword by Lt Gen Attiq Ur Rahman (a former Governor) of West Punjab. The author has stated that it took him 10 years to complete his work. A few observations of Major Moin in his introduction need to be quoted. He mentions that this is the only battle of the two Sikh wars, where Sikhs could fight under their honest and capable leader. During the first Sikh war, the Sikh army in field had suffered from constant palace intrigues and was betrayed by its own commanders. The Sikh artillery which played a vital role in this battle was commanded by General Elahi Buksh and also there were a number of Muslim officers and soldiers in the Sikh army. We won the battles, but we lost the fight. An interesting historical fact is that the battle of Chillianwala was fought perhaps in almost the same area where Porus with his elephants, chariots and archers had battled Alexanders cavalry 2175 years earlier. In 326 BC, Alexander first bivouacked on the western banks of the Hydaspes river (present Jhelum) and after some months of reconnaissance, crossed the river some 20 miles upstream, via a mud island, and then swung southwards to surprise Porus, whose much larger but ponderous army, was ultimately defeated by the smaller, but more mobile, Macedonian army. The site of Alexanders classic crossing is near where the Lower Jhelum Canal starts at Rasul Head Works, a part of the Mangla Dam Complex. Another interesting but little known fact of history is that every invasion into the subcontinent came from West to East across the Indus from 2000  1500 BC, when the Aryans came in, till the Saddozai Duraanis up to 1818. Then for the first time the tide was reversed in 1826 when Ranjit Singh and the Punjab Durbar crossed over from the East to the West to build an empire which took in its stride every bit of territory through the N.W. Frontier up to Kabul, and which included Kashmir, Ladakh, Garo, Tuklakote and Rudok in Little Tibet. This was Ranjit Singhs undisputed empire, conquered and governed by his Afghans, Gurkhas, Dogras, Muslims and Sikhs. As advisers and administrators, he had one of the famous Fakir brothers, Azizudin, to look after foreign affairs, the Kashmiri Brahmin Dina Nath to handle revenue and finance. For his army, he employed great military captains from Napoleans Grand Armee: Jean Francis Allard, Jean Baptiste Ventura, Paola Avitable were amongst them. In Henri Court he had a great caster of guns, who alongside Ranjit Singhs master gunner, General Elahi Buksh, created regiments of artillery which could hold their own against any European army. The British consensus was that Ranjit Singhs units were almost as good as the best in the British army and far superior to the mercenary "native" Indian units which were trained and employed by the British. As for as diplomacy went, Maharaja Ranjit Singh held back the further expansion of his eastern frontiers, also denying further expansion to the British. At the same time Ranjit Singh expanded westwards, right up to Kabul, where he had no restrictions. Not having left a leader to continue after Ranjit Singhs death on June 27, 1839, the Punjab Durbar went through a traumatic period. His eldest son, Kharak Singh, proved useless. He ruled briefly before he died and his son, Nao Nihal Singh, was killed soon after. Then came a brief period under the second son, Sher Singh, when the Punjab Durbar somewhat settle down and even expanded into Kashmir, Little Tibet and Ladakh in the North-East and up to Kabul in the North-West. However, the British, who were looking for ways and means to annexe Punjab, succeeded in creating major rifts among the Sikh chieftains and ultimately, as it appears, got Maharaja Sher Singh and his Chief Minister, Dogra Dhyan Singh, assassinated by the Sandhawalia sardars. The Khalsa army reacted violently: Ajit Singh Sandhawalia was killed and Attar Singh, his brother, fled for safety to the British. The British had built up their army from 17,000 to 40,000 men by the autumn on 1845. To the Punjab armies and their council, it was clear that the British were now looking across the Sutlej, the common river border. The Durbar then started its own preparations to meet the British threat. The British questioned such Punjabi preparations and were openly informed that these were to counter the British aims. To forestall a possible link between the two forces of the C-in-C Lord Gough, and the Governor General, Lord Hardinge, armies of the Punjab Durbar began to cross the Sutlej on December 11, 1845, at Hari ki Pattan, still their own territory across the river. However, on December 13, the British declared war on the Sikhs, although many of their own commanders were convinced that the Sikhs had committed no violation. Thereafter again there was treason and treachery within the Sikh high command. On November 30, 1845, the detailed battle plans of the Sikh army, treacherously given by Generals Lal Singh and Tej Singh, were placed before Sir Henry Hardinge and Lord Gough. The Sikhs had aimed at cutting Ferozepore from the other British forces and to then deal separately with those forces coming from Ambala and Ludhiana. Treachery got the better of the Sikh army at the battles of Mudki and they were forced to withdraw. At Ferozeshahr, notwithstanding this treachery, the Sikhs recovered what had been lost and the British army suffered terrible casualties, with every single member of the Governor-Generals staff either killed or wounded. General Sir Hope Grant recorded, "The fate of British India trembled in the balance. Truly, the night was one of gloom and foreboding and perhaps never in the annals of warfare has a British army on so large a scale been nearer to defeat which would have involved annihilation". The British were preparing to destroy their documents and work out unconditional surrender terms to save their wounded. Then true to his treacherous role, Tej Singh arrived, the Sikh guns opened random fire even when the British had no more ammunition left to respond but suddenly, as Tej Singh had promised the British, he withdrew his forces, leaving the battlefield to the British. The Sikh victory had been converted into a defeat. Thus ended the First Sikh War. disgust of having been betrayed, created a fresh anti-British sentiment and was the root cause of the Second Sikh War, three years later. The Punjabis, now under able commanders, got ready to pay back at Chillianwala the debts they owed the British. There was a spontaneous uprising starting with the Sikh Durbar Governor of Multan, Diwan Mulraj, and then by Sher Singh Attariwala in Hazara. Outraged by this and seeing the situation getting out of control, Lord Dalhousie declared war against the Sikhs on November 9, 1848. The first action at Ramnagar gave the Sikhs a clear, morale raising victory. This time around, they were not going to let treachery get the better of them. Lord Dalhousie, stunned by this reverse, prepared for a major attack on the Punjabis. On January 13, 1849, the Punjabis sighted the British advancing towards Chillianwala with a view to force them into the Jhelum. 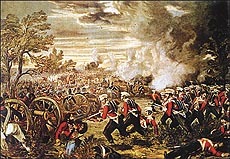 General Elahi Bukshs artillery first brought the British advance to a standstill. As the British launched their assault, the Punjabis withdrew to the bush jungle, and started hit-and-run tactics. Their snipers took a heavy toll while the main assault was blunted by Sikh cannon, infantry hand-to-hand fighting and cavalry charges. The British lost many guns, some regiments lost their colours and in two hours, 3000 dead and wounded soldiers were left on the battlefield. Rain separated the foes for three days and on the fourth day the British withdrew. However, the Punjabis failed to drive home their advantage, ostensibly because of the lack of a strategic plan as well as failure to realise the magnitude of the punishment inflicted on the British army. Ultimately in the Battle of Gujarat on February 21, 1849, short of guns and manpower, the Punjab Army gave way to British infantry attacks and cavalry charges, to finally surrender near the Rawalpindi. Thus, came to an end the empire that Ranjit Singh had built and along with it went the famous Kohinoor to the British. A few words about the treatment of British prisoners by the Punjabis. It was always favourably commended by the British soldiers  though not always by British historians. The British Subaltern wrote: "Two of the 9000 lancers who were taken prisoner the other day were sent back this morning with Sher Singhs compliments. They seemed rather sorry to come back as they had been treated like princes, Pilawed with champagne and brandy to the masthead and sent away with Rs 10 each in his pocket!" On March 14, 1849, both the Attariwala sardars, father and son, came to the British camp at Hurmel, near Rawalpindi, with their faces covered under their shawls and gave up their swords to General Gilbert. They were followed by batches of hundreds. "The reluctance of some of the old Khalsa veterans to surrender their arms was evident. Some could not restrain their tears; while on the faces of others, rage and hatred were visibly depicted," wrote General Thackwell. The remark of a veteran, as he put down his gun, summed up the history of Punjab: "Aj Ranjit Singh mar gaya (Today Ranjit Singh has died)."